Captain William Sumner was born in 1786 in Northampton, England; he boarded a British vessel as a steward of the captain, and came to Hawaiʻi in 1807. Captain William Sumner served as one of the captains on ships in this fleet. In doing so, he also participated in some of the monumental moments in Hawai‘i’s history of his time. When Kamehameha called for Kaumuali‘i to meet, in 1810, reportedly, it was Sumner who accompanied King Kaumuali‘i to Pākākā for the peaceful settlement between Kaumuali‘i and Kamehameha. After this meeting, Kaumuali‘i returned to Kauaʻi, but because Kamehameha took a fancy to Sumner, he was held back to stay with Kamehameha. Sumner became one of the few who lived with the family of Kamehameha. In 1817, he was Chief Mate on Brig Forrester, bound for China, under the command of Alexander Adams. On this trip they proceeded first to Kaua‘i to haul down the Russian flag at Fort Elizabeth. After expelling the Russians, they then sailed for China. In addition to interisland travel, Sumner captained ships for trade for the Kingdom. In 1821, he commanded the Brig Thaddeus and sailed for Kamchatka with a load of salt; in 1824, he was given charge of the brig Ainoa for a sealing voyage, returning October with 5,845 fur skins, a quantity of elephant oil and fish; in 1829, he took charge of the Brig Neo bound to Tahiti, to recover “lost” cargo; and over the years, he transported sandalwood. In 1822, Captain Sumner captained an expedition to claim Nihoa as a possession of Hawai‘i. He also took Ka‘ahumanu and a royal party including Kaumuali’i, Liholiho, Keōpūolani and Kahekili Ke‘eaumoku on a visit to Ni‘ihau. Some foreigners, like Captain William Sumner who sailed ships for Kamehameha, Liholiho (Kamehameha II) and Kauikeaouli (Kamehameha III,) were awarded land grants for their services. Following the Mahele, Mokapu Peninsula was kept as Crown Lands. Koʻolaupoko District Chief Abner Pāki was awarded over 3,000 acres in Heʻeia ahupua`a (LCA 10613) and Queen Kalama, wife of Kamehameha III was awarded over 9,000 acres in Kāneʻohe ahupuaʻa (LCA 4452). Both awards were given for nearly the entire ahupuaʻa. Pāki’s portion of ili Mokapu was sold at auction to brothers William and John Sumner and included 464 acres. John Sumner became sole owner upon his brother’s death, and left the lands in trust to Robert Wyllie Davis, his nephew. The area was later divided into house lots in 1932 and sold off. In 1940, by Federal Executive Order through the U.S. Navy, all 331 parcels on the 464 acres were condemned and a Declaration of Takings enacted. Sumner married the High Chiefess Keakuaaihue Kanealai Hua in 1818; they had three children, William Sumner, Jr.; John K. Sumner; and Maria K Sumner. In 1847, William Sumner died; he’s buried at O‘ahu Cemetery. 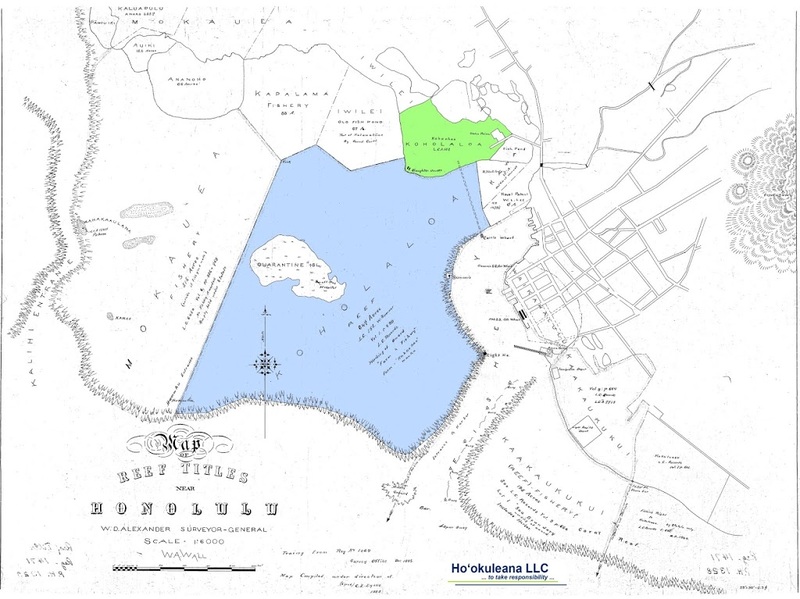 The map shows the approximate area of William Sumner’s 60-acres of “farmland” (green) and 647-acres of “fishery” (blue) – this covers most of what is now Honolulu Harbor and Sand Island. Note Sumner’s house across from what is now downtown Honolulu. In addition, I have added other related images in a folder of like name in the Photos section on my Facebook and Google+ pages.